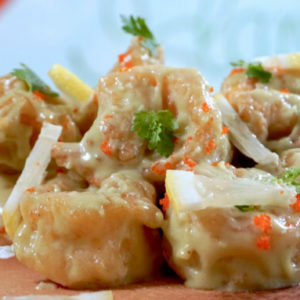 I had my first taste of wasabi prawns at Peach Garden Restaurant several years ago . 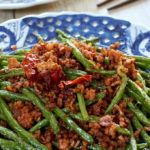 As usual, it is my hobby to use my tastebuds to guess all the different ingredients that go into a particular dish so that I can try to replicate it for my family’s next meal. 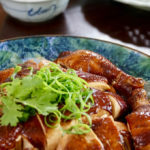 It took me several attempts before I succeeded – the first few times I experimented, the sauce was either too bitter because I added too much wasabi, or too sweet and runny because I had added the juice of one orange, the juice of half of lemon and honey into the mayonnaise. 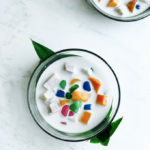 Finally after further experimentation and adaptation from other recipes like Sam Leong’s recipe, I realized that condensed milk was the missing mystery ingredient. Finally I have succeeded in fine-tuning this recipe to please my family’s palate. 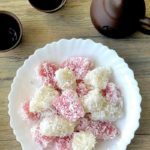 I hope you will find it delicious too! It’s easy to make! 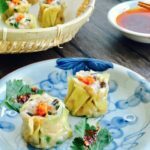 There’s not many ingredients that’s needed for this dish, and it is easy to prepare and cook it. The different flavours compliment each other. 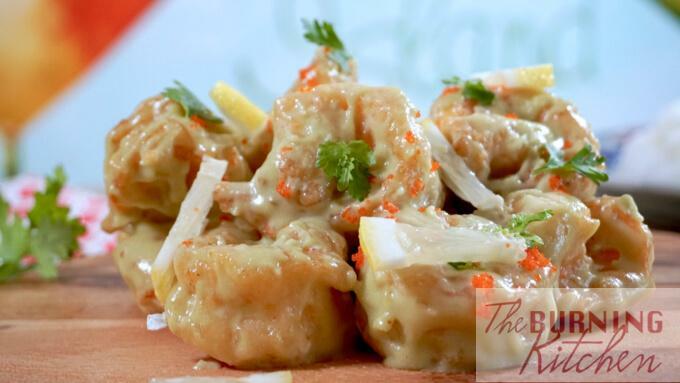 The spiciness of the wasabi, combined with the creaminess of the mayonnaise, makes for a great sauce. Put that together with fresh, springy prawns and it’s a winning dish! 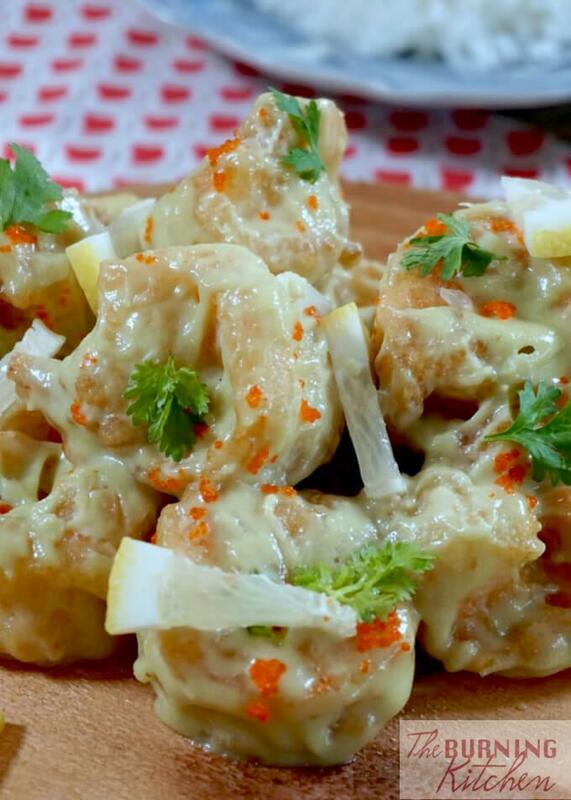 HOW TO MAKE WASABI PRAWNS? De-shell and de-vein the prawns. Wash the prawns, drain dry and place in a bowl. In a separate bowl, lightly beat the egg white. Add salt, sugar and egg white to the prawns, and mix well. Cover with cling wrap and leave in the fridge for 15 mins. 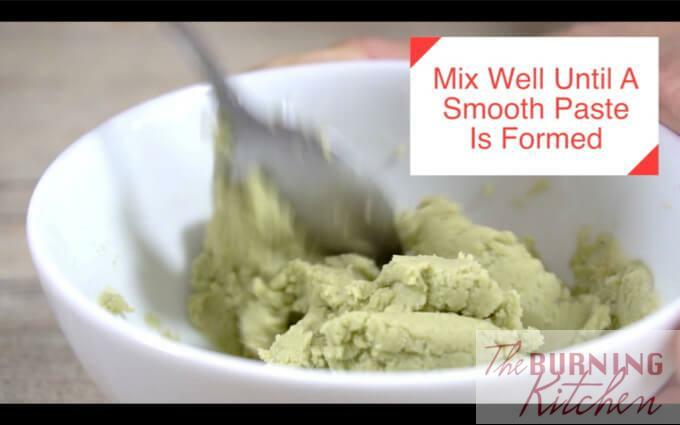 Place the wasabi powder into a small bowl, and add in water. Mix well until a paste is formed. 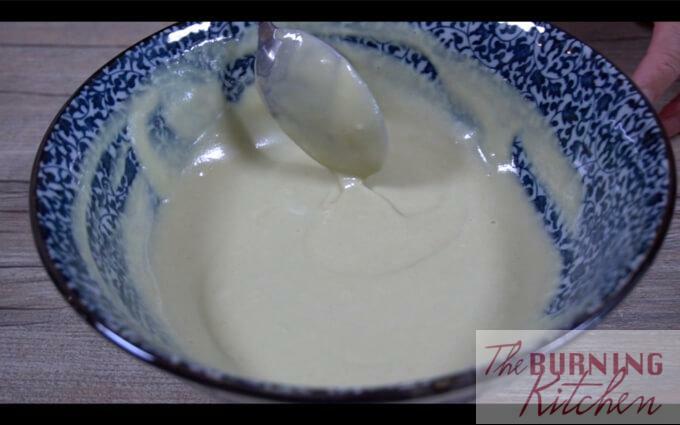 Add in the mayonnaise, condensed milk, and wasabi paste into a big bowl. Mix well until smooth. Cover with a cling wrap and set aside for later use. 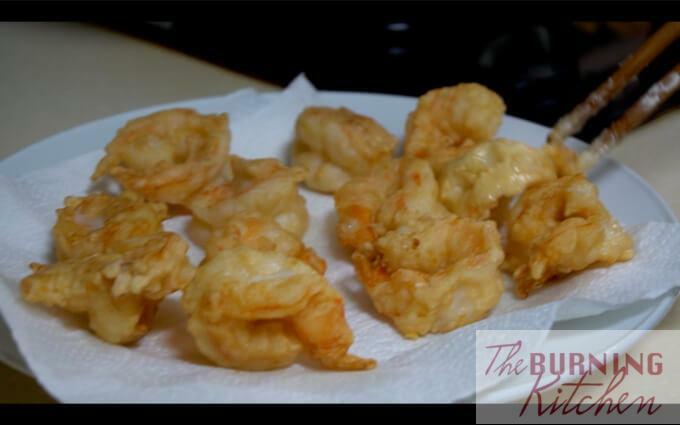 Just before deep-frying, take out the prawns from the fridge. Add in the sweet potato flour and corn flour, then mix well ensuring every prawn is well and evenly coated with the batter mixture. Heat up the wok with the 1 bowl of oil over medium heat. Then add in the prawns one at a time, making sure that the prawns do not stick to one another. Deep fry for 2-3 minutes until golden, then place on paper towel to absorb the excess oil. 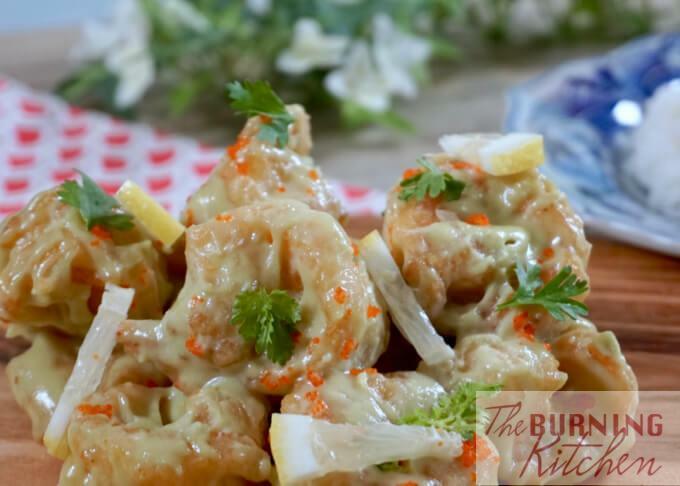 When all the prawns have been fried and while still hot, put the prawns into the bowl of wasabi mixture immediately and toss them well ensuring that every prawn is evenly coated with the wasabi sauce. Transfer the prawns on a platter and garnish it with black sesame seeds and ebiko. Serve immediately. Use fresh and big prawns. I like to use Red Leg Prawns (红脚虾 Ang Kar Hay) whenever I make Wasabi Prawns. Check out my post on how to freeze and pack fresh prawns if you are buying extra prawns that you need to freeze for another time. Take out the prawns from the freezer at least 1 hour before to defrost if you have pre-frozen your prawns. HOW TO PREPARE THE PRAWNS? 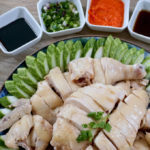 Be carefully not to get pricked by the sharp poisonous needle-sharp tips at the head and tail of the prawn, which can make your fingers swell. For this reason, I always like to cut off the tips of the prawn immediately before I do anything else to them! Remove the prawn shells carefully so that the tail remains intact. That is my favourite part of the prawn! 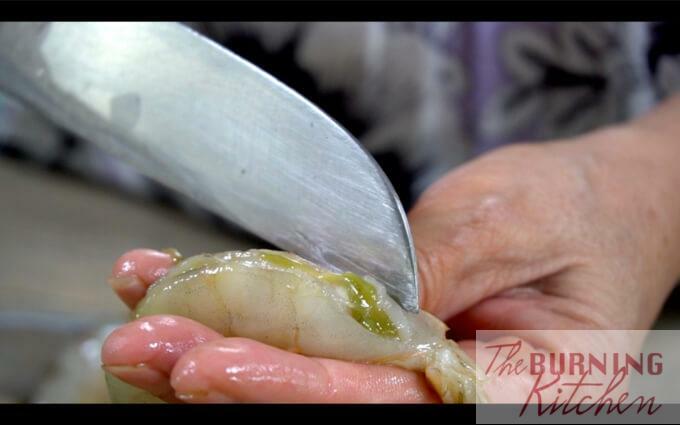 Click here to see how I devein the prawn, if you are not sure how to do it. 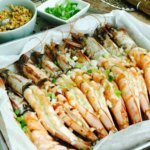 HOW TO MAKE PRAWNS MORE CRUNCHY? 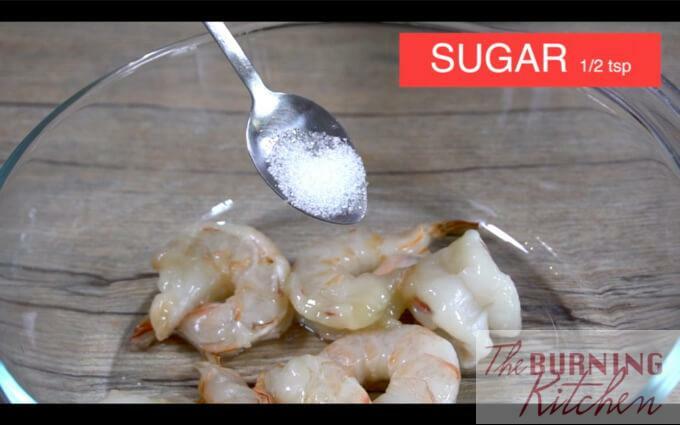 Add sugar as one of the marinade ingredients to make the prawns more crunchy. Refrigerate the prawns for about 20 minutes before frying, as the cold helps to retain the crunchy texture of the prawn. 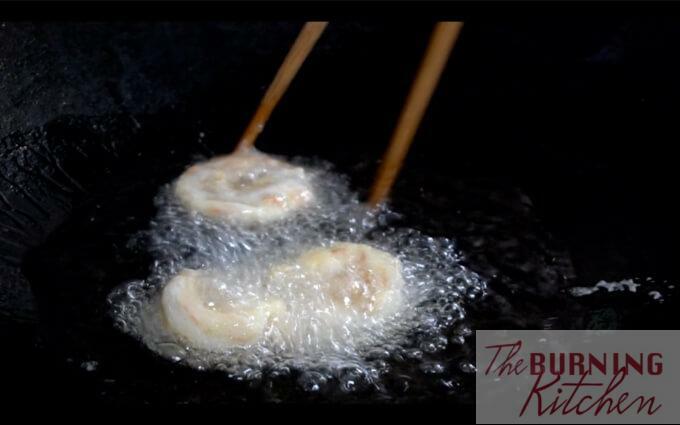 In many restaurants, sodium bicarbonate is added to the prawns to make them super crunchy. However, adding too much can make the prawns lose its natural sweetness and become tasteless, and even give a bitter chemical taste to the prawn. 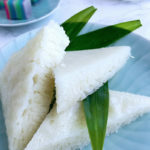 For this reason, I prefer to use sugar and refrigeration, instead of sodium bicarbonate, to achieve the crunchy texture. Add sweet potato flour to batter to give a slight chewy texture when the batter is fried. Coat prawns with sauce immediately after frying, because the heat helps the sauce to be more liquid, so it spreads out more evenly and smoothly. 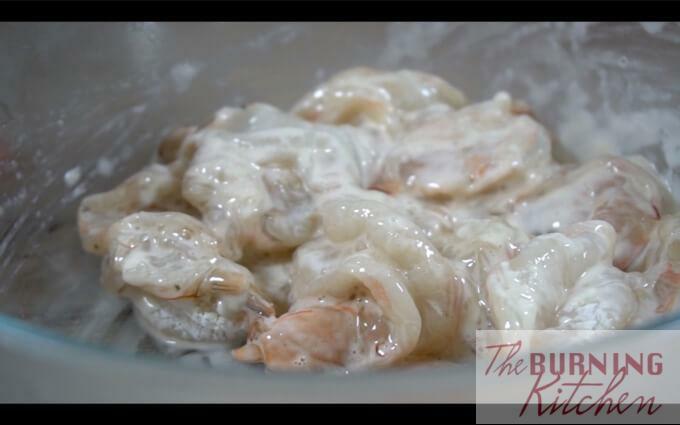 Use chinese rice wine to help mask the prawn-y smell and enhance the taste too. Do not re-fry the prawns. Otherwise they will be over-cooked and tough! Fry when you are ready to serve. After all it takes only a few minutes to do it. 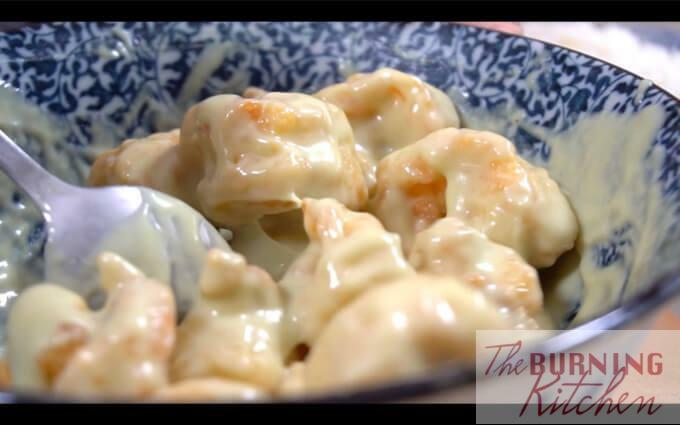 Adjust the amount of wasabi, condensed milk and mayonnaise (for the creaminess) according to your taste. 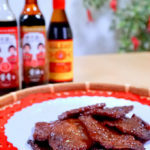 It is best to test the sauce before adding in the fried prawns. If you love our cooking videos, please subscribe to our Youtube channel for more yummy videos! 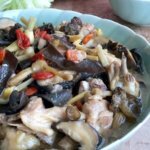 If you are a regular home cook, please join us at TBK Home Cooks Facebook Group where you can post photos of your food, ask questions, share recipes and clean cooking tips from others in the group! These deep-fried large crispy prawns coated in delicious creamy wasabi sauce are a restaurant favourite of many Singaporeans! Welcome to Yum Goggle! 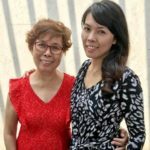 We are following you on FB and hope you will follow us back. If you are on other social media – please follow us so we can follow you back and tag you when we promote your posts. Thanks, Kelli at Yum Goggle!